The Dr. Guislain psychiatric centre, part of the Broeders van Liefde npo (Brothers of Charity), is housed on a monumental site that dates from the 19th century. The plan of the hospital was drawn up by Jozef Guislain, a pioneer in the medical treatment of insanity. The treatment was preferably to be given in a green setting north of the city of Ghent, where the patients could enjoy peace, freedom and security. In the course of time the psychiatric centre was overtaken by urbanisation, so that this monastic stronghold is now part of the city’s suburbs. In 2007 the architect Patrick Lefebure was commissioned to develop a master-plan on the occasion of the construction of new 20-room guest accommodation. An additional reason, no less important, was the request by the local council to open up the orchard as a park for local residents. This proposal was out of the question for the Broeders van Liefde. Although the gardens were already used on an informal basis by local residents, the active promotion of the institution’s site as a public domain would lead to conflict with the care programme. This is because some of the patients need low-stimulus surroundings. The request made by the City Council typifies the history of this care campus and the changing image of mental health care. This psychiatric centre has lost its isolated status in the city and to an outsider nowadays looks like a valuable green zone in the midst of a densely built-up working-class district. The positive image was encouraged by the cultural programme, but equally by changes to the built infrastructure. The dormitories, for example, have long been replaced by individual rooms. An additional entrance has also been created on Francisco Ferrerlaan by purchasing and demolishing a garage. What is more, the law makes it compulsory to establish the psychiatric care home just outside the site of the institution, whereby the wall of the institution is once again opened up in Lorkenstraat. This and other changes force the clinical atmosphere in the psychiatric centre more into the background, and it presents itself as a wide-ranging social programme. However, the request from Ghent City Council compelled the psychiatric centre to reconsider the infrastructural consequences of the care strategy plan and to formulate a coherent vision of its spatial development. The spontaneous developments the psychiatric centre had already undergone provided the basis for the two lines of development. In the first place it made use of the opportunities that arose along the edge of the institution’s site. The proximity of the urban fabric offers possibilities for making connections with the outside world. This can give rise to an open site that is no longer concentrated on the impressive old entrance gateway. The new entrance on Francisco Ferrerlaan, for instance, has taken over a lot of the traffic flow by means of the strategic location of the car park and the new catering department. 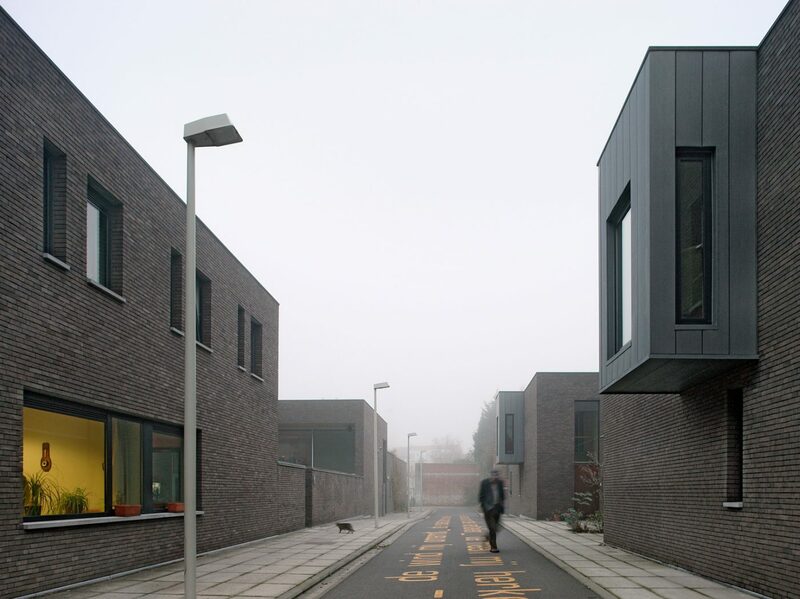 The Lorkenstraat psychiatric care home is also directly accessible because the new building was created as a cul-de-sac that links up with the street of that name. Both entrances can be monitored depending of the needs of the moment. The development scheme elaborates on this condensation on the fringes of the institution. An additional expansion of the Lorkenstraat psychiatric care home is planned, in the form of another cul-de-sac as an extension of the street. An expansion zone has also been planned on the extreme northern boundary of the institution site, which provides a response to the adjoining terraced houses and back gardens. In this way the planned expansion zones translate the housing type in the neighbourhood around the institution in a highly individual way – both their appearance on the street and in the small back gardens and rear extensions. The patients live together virtually in individual homes which are nevertheless linked together by strategic passageways, patios and service corridors. Secondly, advantage is also taken of the opportunities provided by the historical hospital complex. The 19th-century infrastructure is hard to adapt to contemporary standards of care and accommodation. But demolition is not desirable because of the exceptional value of the buildings as heritage. The concentration of the care programme in the new buildings on the edges of the institution site enables the complex of historical buildings to be developed for public functions, such as the museum, the training centre and the school. At the same time, new, limited building outlines were designed that do justice to the spatial structure of this complex. The new wing for guest accommodation, for example, fits in seamlessly with the monastic architecture of the old hospital and completes this structure with a new enclosed garden. Both lines of development match the general objective of the master-plan, which is to create an agreeable residential environment for patients without detracting from the clinical aspect. The domestic setting focuses on the normal human desires for a home, such as security, residual spaces and identity. In the spatial regime of the old collective housing facilities, these elements of housing were denied psychiatric patients. Nowadays, not only does each patient have the right to their own room with bed and washbasin, but also the right to be themselves in a normalised urban fabric. The spatial environment for psychiatric care is transformed from a place for clinical treatment into a residential setting in which an individual patient can feel at home. Identification among patients is enhanced by the simulation of a normal urban fabric where there is also room for residual spaces so that an individual can move about freely. The gardens – safeguarded as a green lung by limiting the condensation to the fringes of the site – are an indispensable means to this end. So the spatial master-plan is the first step towards undoing the historical alienation that used to occur in a psychiatric hospital.